Because dry-aged beef demands time, expertise, and specialized equipment, it can be tough to find. Few supermarkets carry dry-aged steaks or USDA Prime beef, making it near impossible for some Americans to get their hands on dry-aged beef from local retailers. Look for the USDA Prime shield. The USDA’s Prime rating is the most important mark of superior beef. USDA Prime-rated beef has exceptional tenderness and flavor, as well as abundant marbling—the streaks of white, intramuscular fat that melt into beef as it cooks, basting beef fibers with smooth, buttery goodness. Choose a superior cut. Dry-aging can’t save an inferior cut of beef. Ribeyes, NY strips, porterhouses, T-bones, and tenderloins are the crème de la crème when it comes to gourmet steaks. These cuts are known for superior tenderness, flavor, and/or marbling. Know how long you like your steaks aged. It’s important to know how long you like your steaks aged. It’s even more important to ask how long your seller ages their beef. For first-timers dabbling in dry-aged steaks, we recommend starting out with steaks aged between four to six weeks. Find a seller you can trust. Some retailers mislabel wet-aged steaks to try to trick consumers. Others use “in house” rating systems to bypass the USDA’s quality control systems. Finding a butcher, online retailer, or specialty store you can trust is hugely important to finding high quality dry-aged beef. 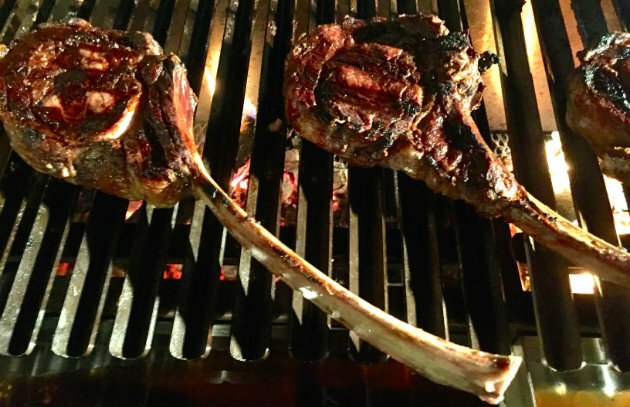 Cooking a dry-aged steak doesn’t take any specialized knowledge or equipment beyond the grilling basics. But with a steak this prized, you’ll want to make the extra effort to get things right. Set-up a two-temperature grill. On a charcoal grill, build up the coals only on one side. On a gas grill, turn the heat up as high as you can on one side and leave the other side either off or on the lowest temperature setting possible. Season your steak no more than five minutes before grilling. You can choose a simple mix of coarse salt and fresh-cracked black pepper or a steak-specific rub, like Chicago Steak Company’s. Set your steak on the low-temperature side of your grill. Cook the steaks covered, turning every 3–4 minutes. Use a meat thermometer to carefully monitor the temperature of your steaks. Once your steak is 15 degrees Fahrenheit below desired doneness—115 F, if you’re aiming for medium-rare—transfer your steak to the high heat section of your grill. Sear uncovered, flipping as often as you like. (Grill-marks, while pretty, actually burn your steak). Once your steak has developed an even, crunchy brown crust on both sides, remove it from the grill. Allow your steak to rest on a wire rack over a sheet pan for five minutes before serving. Alternatively, you can use a similar method indoors by bringing your steak up to temperature on a wire rack in your oven, then searing it in a blistering cast-iron pan. For more great steaks and useful info on all things beef, visit us at MyChicagoSteak.com. Click here for steak recipes. Read more about the reverse sear method.